It is hard to believe that October is already here! This month can be a great time for teachers to fill lesson plans with some fun activities that are fall and Halloween related. To add a little fun to your lessons, here are some simple, but fun ideas for the month of October. One of the easiest ways to add some October fun to your reading lessons is with books. Here are a few of my favorite read-alouds for this month. The Best Halloween Ever is another book in the series by Barbara Robinson that will have your students laughing nonstop. (If you have not read The Best School Year Ever and The Best Christmas Pageant Ever, they are some of my students' favorites!) The hilarious antics of the Herdmans continue in this funny book that your students will love. This is a perfect book to read and enjoy in October! Now, I love a beautiful picture book, and this one definitely fits into that category. This picture book beautifully illustrates the poem by Mary Howitt originally published in 1828. Not only are the illustrations beautiful, but they will help students to understand the poem. I love to engage students in discussions of the illustrations and how they contribute to the poem, how the illustrations contribute to the mood of the poem, and once the book is read, discuss the theme of the poem. Chris Van Allsburg is one of my favorite children's authors and illustrators, and The Widow's Broom is my favorite October picture book, hands-down. This book can be used to teach a variety of strategies and skills, but best of all, this is such a wonderful story to read. The story begins with a widow named Mina Shaw. While flying her broom over the widow's farm, a witch falls to the earth when her broom looses its magic. When Mina Shaw finds the witch, she decides to welcome her into her home so she may heal from her injuries. Once better, the witch leaves, leaving the broom behind. At first, the widow finds the broom ordinary, but eventually she realizes it is magical, and it becomes annoying because of its constant sweeping. Soon she teaches it other chores, and the broom becomes a very helpful companion to Mina Shaw. The neighbors, the Spiveys, cannot see the good the broom is doing, and they believe the broom is evil. After the broom teaches the Spivey boys a lesson, the father wants it destroyed. When men come to take the broom, Widow Shaw shows them where the broom sleeps, and Mr. Shaw along with other men take the broom and burn it; however, the "ghost" of the broom is soon seen around the Spivey house causing the scared Spiveys to move away. At the end, readers discover that the widow tricked the Spiveys by giving them a regular broom. Students must make inferences to understand the end of the story. It is always so much fun to see the "light bulb" moment when students realize and understand what truly happens to the broom at the end of the story. This book also great to teach story elements, theme, foreshadowing, point of view, as well as acceptance and bullying. Whether you are reading an October themed book or not, October themed graphic organizers are a great way to add some fun and interest to your reading lessons. My set of Halloween themed graphic organizers are great to use with not only the books listed above, but they are also great to use with almost any book or text. A variety of fun graphic organizers are included such as the one seen in the picture above. There are also graphic organizers that can be used with nonfiction text, like the one pictured below. Click on either picture to find them in my TpT store. My Halloween themed parts of speech quilts are a fun way for your students to review the parts of speech. 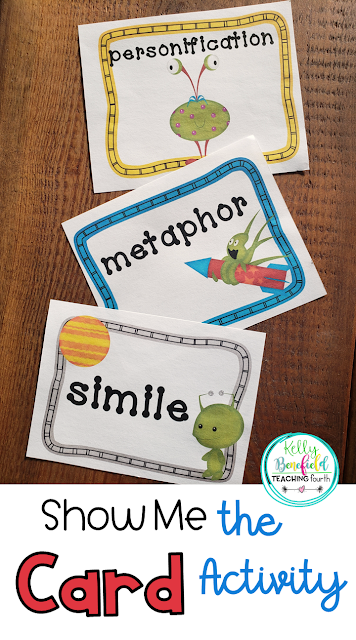 Your students will love coloring to identify the parts of speech while creating fun quilt pieces that make a great hallway or bulletin board display. I love using these after a test or on days that we do not have specials (activity). A great way to keep your students focused this October is to use callbacks. These are my favorite October callbacks to use with my students. Surprisingly, even 4th and 5th graders enjoy using callbacks. Best of all, they really work to get students focused and ready to listen.